This page's sole purpose is to provide readers with interactive charts and graphics regarding South Africa's Fiscal Policy (Government tax revenue and spending programs). The page will be updated on a adhoc basis as more data becomes available from National Treasury. Fiscal policy is a hot topic right now, as ratings agencies deciding on South Africa's credit ratings takes a very long hard look at South Africa's fiscal policy. PRETORIA (Reuters) - South African collected an estimated 1.287 trillion rand ($91 billion) in tax in the 2018/19 fiscal year, about 15 billion rand short of the government's target, the revenue service SARS said on Monday. "SARS is concerned that the levels of compliance have declined in the last few years and we are seeing the results of that in these figures," acting tax commissioner Mark Kingon said. Fiscal year 2018/19 ended in March. South Africa aims to collect about 10 percent more in tax -- 1.4 trillion rand -- in 2019/20, the revenue service said. Corporate income tax was down 3.2 percent compared to the estimates made in February's budget, while personal tax collections were down 1.2 percent compared to target. "The slow improvement in production and employment following poor investment growth in 2018 as well the moderation in global trade and investment, presented a weaker outlook for the economy," Kingon said. We take a look at a article published by Statistics South Africa which relates strongly to South Africa's fiscal policy. Believe it or not, there was a time – not so long ago – when the South African government actually spent less than it earned. Stats SA takes a look at government spending over 13 years, focusing on how much we pay to service our debt. Harking back to better times in February’s National Budget Speech, Finance Minister Tito Mboweni quipped that his predecessor, Trevor Manuel, had given out succulent plums to highlight the prosperous times the country had then found itself in. If state expenditure is taken as a measure of better times, there was a three-year period (2005/6 to 2008/9) when government spent less than it earned, enjoying a surplus over that period. This is according to time series data from Stats SA’s Financial statistics of consolidated general government report. This didn’t last for long, however. The succulent plums quickly shrivelled under the strain of various factors, including the 2008–2009 global financial crisis. The economy floundered in 2008/09, sliding into recession for three consecutive quarters. Government revenue fell in 2009/10, mainly underpinned by a fall in tax collected from businesses. Revenue bounced back the following year, but not enough to lift government out of the red. Since 2007/08, government has consistently spent more than it earns. The deficit in 2016/17, for example, amounted to R156 billion. It should be noted that a budget deficit is not uncommon across the world and should not automatically be seen in a negative light. Countries generally borrow money to cover financial deficits so that they can provide services to their citizens. South Africa’s gross loan debt stood at R2,2 trillion in 2016/17, according to the National Treasury. This translates to about R40 000 per person living in the country. Servicing this level of debt can be expensive. Interest payments accounted for 9,2% (or R146 billion) of general government expenditure (R1,58 trillion) in 2016/17. In other words, for every R100 of total spending, R9,20 was used to pay interest on debt. This is more than what was spent on the hospital (R105 billion), tertiary education (R77 billion) and housing (R69 billion) functions during that period. National Treasury expects this figure to rise, reaching 13% of total expenditure in 2021/22. How do we square up against other countries? 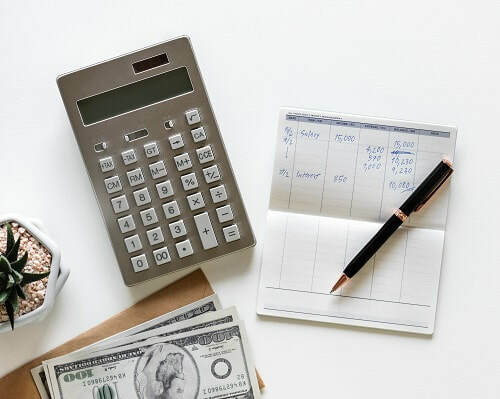 South Africa devoted a larger proportion of its budget to paying interest than other countries such as Russia and China, according to data from the International Monetary Fund (IMF). Of the 109 countries for which data are available, Lebanon, Sri Lanka, Jamaica and Brazil devoted the highest proportion of their respective budgets to interest payments in 2016. Zambia was ranked in 5th place, an indication of the country’s rapidly expanding debt burden.11 South Africa was ranked in 30th position. 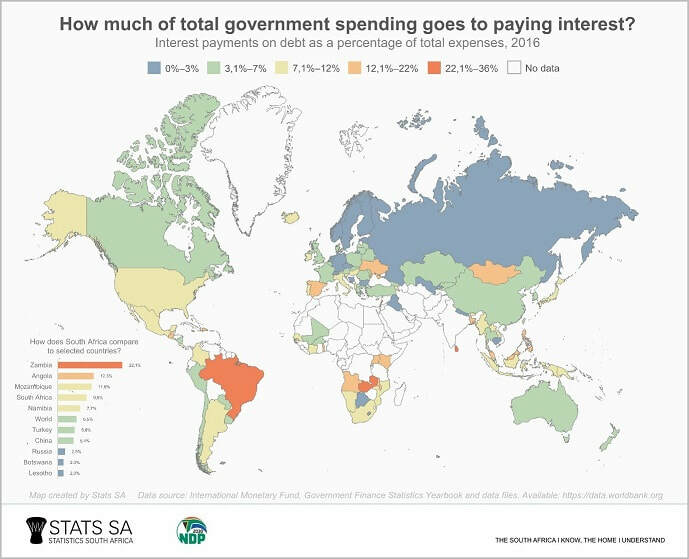 South Africa has a higher interest payment burden than some of its neighbours. Namibia, Botswana and Lesotho all contribute proportionally smaller chunks of their budgets to service debt. Unfortunately, government financial data are not available for Zimbabwe, eSwatini and Madagascar, as confirmed by Open Data Watch. Reasonable spending and reducing South Africa’s debt were two important prescripts underlying the National Budget Speech in February. In the words of the Minister of Finance, if “we plant anew” seeds that will set us on the track to renewal, we will be able to return the “plum” times that we once enjoyed. Download the Financial statistics of consolidated general government report and time series data here. 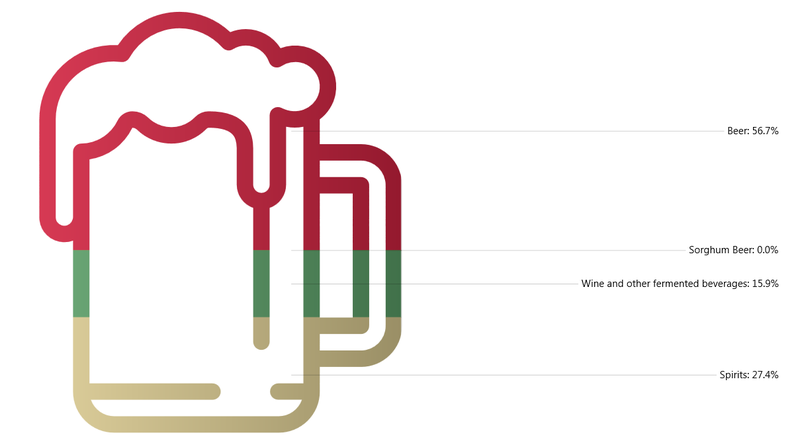 As the image above shows the bulk of South Africa's excise collected on alcohol is expected to come from Beer, with beer making up almost 57% of expected excise to be collected on alcohol. The summary below shows the relative contribution of the various alcohol types to expected excise to be collected for the 2018/2019 tax year. So if you dont want your drinks to be taxed to death, time to start making and drinking sorghum beer. Today's update takes a look at the South African government's planned expenditure for 2019/2020 grouped by various economic categories. No real surprise in what makes up the South African government's biggest expenditure. It is compensation of employees. All the evidence shows that government has a bloated public service. Even if the minister in the Department of Public Service and administration (DPSA) disagrees. We take a look at the latest forecasts and estimates of government revenue and expenditure up to the year 2022. And there is little to no hope for South Africa's government finances in the short term, with expenditure estimates far outstripping expected revenue collection from 2019 to 2022. The image below obtained from the National Treasury shows the predicted revenue and spending of government for the next couple of years. ​At R252 billion SA's government will borrow roughly R1.14 billion a day! Let that sink in. Imagine how many houses government could build for the poor with just the interest that will be paid on all these borrowings. In this update we take a quick look at the amount of "Sin taxes" collected by South Africa's government on Beer, Wine and Spirits during the 2018/2019 fiscal year. The line chart below shows the monthly taxes collected on various alcohol types since April 2018 up to December 2018. From the above it is clear that Beer is the main contributor to sin taxes paid by alcohol type. According to National Treasury''s budget the three types of alcohol was expected to bring in the following amounts for the full 2018/2019 fiscal year (so up to March 2019). So with 3 months left of the fiscal year, it looks like taxes collected on Spirits are on track (with 75% collected over 75% of the months of the fiscal year). However taxes collected on wine and other fermented beverages (69.5%) and Beer (65.3%) is lagging behind the 75% one would have expected it to be at by considering 9 of the 12 months of the fiscal year have passed already. Question is will taxes collected end up being close to the budgeted amount? If not this shortfall will have to be made up somewhere else, or South Africa will have to borrow more if government is not willing to cut its budget to ensure it is inline with what it collects in taxes. The graphic below South Africa's fiscal policy in a nutshell over time. 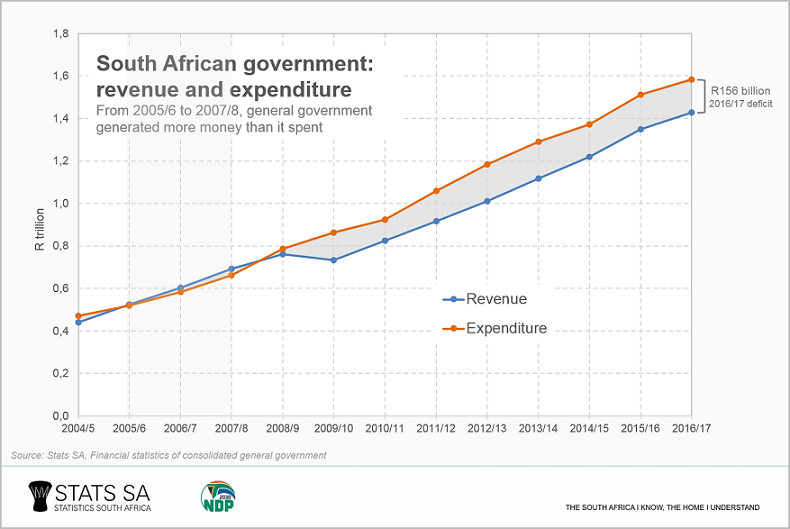 It shows the Rand value of revenue collected by the South African government as well as the money spent by government. The orange line shows the surplus/deficit of the government's budget. As the graphic shows, South Africa's budget has been in deficit for a number of years and any budget deficit implies the government has to borrow money to cover it's expenses as its revenue collected cannot cover expenditure items. Essentially equating this to a household budget, government is borrowing more and more as governments income is not enough to cover its expenses. Essentially government is living beyond it's means. So where is governments money it is spending going and where exactly is it coming from? The image below shows the breakdown of taxes from various tax income sources. As seen from the graphic personal income tax accounts for almost 37% of all taxes collected, VAT accounts to almost a quarter of taxes collected (26.3%) and company income taxes makes up around 18% of South Africa's taxes collected. 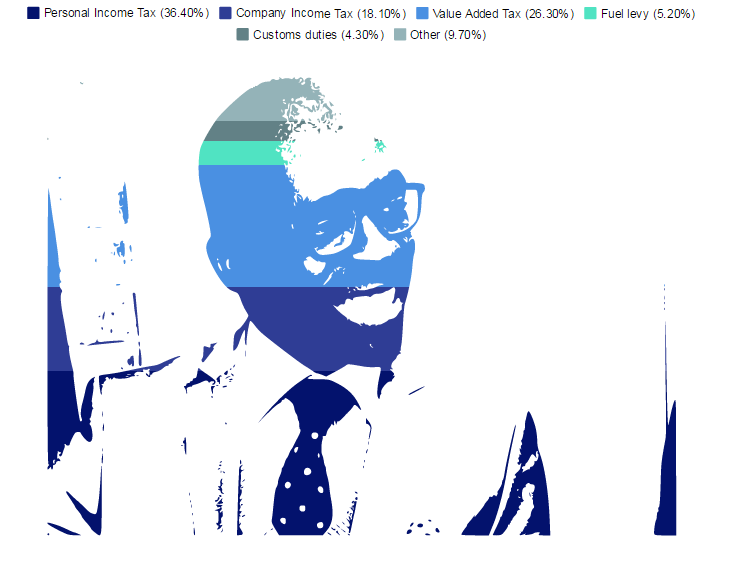 Finance Minister Malusi Gigaba, with tax revenue sources overlaid. The graphic below breaks down government expenditure according to economic classification (as per the 2016/2017) budget estimates. Concerning is the fact that debt-service costs makes up over 10% of government's expenditure, and this is set to rise to around 11% by 2019/2020. With further ratings downgrades on South Africa's debt imminent this should increase even further as interest on future debt needs to be more to compensate investors for the increased risk they are taking for investing in sub investment grade debt such as South Africa's government debt. The stacked bar chart below shows the contribution of various categories to total government spending. From the stacked bar chart above it is clear the single biggest contributor to overall government spending is compensation of employees. With employee costs taking up more than a third of total government spending. The second largest category for government spending is households. This will include all social grants/welfare payouts to households in South Africa. Worrying is the fact that debt servicing costs make up more than 10% of total government spending. Government is set to spend R146.2billion on debt servicing costs during the 2016/2017 financial year. That is a eye watering amount of money to be spending on servicing debt. And as we reported in this blog post, the amount of money going towards servicing debt is set to continue increasing as investors demand higher yields for increased risk in investing in South African government debt. While the above looked at the contribution of various categories to total government expenditure, the bar chart below shows the expected increase/growth in spending per category per year up to financial year 2019/2010). The two categories that is expected to show the strongest growth over the next few years are Higher Education institutions (as pressure mounts on government to provide free higher education to students). This process was largely driven by the #feesmustfall campaign. Another category that is predicted to show strong growth in spending is debt servicing costs (this is expected to grow by 10% per year over the next 3 years). If this growth materializes, by 2019/2020, debt servicing costs will make up over 11% of government's total spending (or R197billion) spent on servicing the government's debt. Now imagine the type of services and goods government can could deliver to the people of South Africa if it was debt free and did not need to pay this debt servicing costs. We are sure labour unions have taken note of government's expected growth in the compensation of employees over the next few years. Government is expecting this to grow by 7.2% per year over the next couple of years. Well above the current and expected inflation rate as predicted by the South African Reserve Bank (SARB).